This is a hearty, warming bowl of stew that is so delicious it will be a family favorite. Perfect when served with a salad, and slices of rye bread for the family. Buy a fresh tin of sweet Hungarian paprika for this dish. Szeged brand is usually sold in the spice section of your local supermarket. In an Dutch Oven or covered large pot cook bacon over medium high heat until crisp. Transfer with a slotted spoon to a large bowl and set aside. In bacon fat remaining in pot, brown meat in small batches over high heat, transferring it as browned with slotted spoon to bowl. Pour off all but two teaspoons of oil. Reduce heat to medium and sauté onions and garlic until golden. Stir in paprika, caraway seeds, and tomato paste then stirring constantly, cook for 2 minutes. Stir in broth, beer, bell pepper, mushrooms, bacon, and browned meat along with any accumulated juices; bring to a boil. Season with salt and pepper. 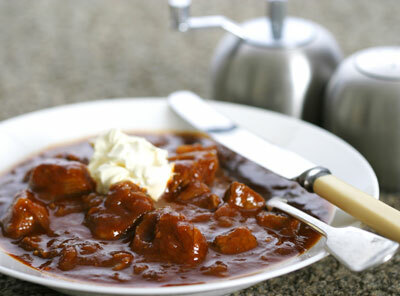 Cover, reduce heat and simmer until beef is very tender and falls apart when pressed with spoon, 2 ½ to 3 hours. Serve with a small dollop of sour cream.